OUYA, the Android-based gaming console that made waves when it first launched on Kickstarter last year, met its first shipping target at the end of December when it sent out development consoles to early backers. Now in the new year it faces a direct competitor, one that is also seeking financial backing from the crowdfunding site, in the form of GameStick. GameStick will be Android-powered like the OUYA, and even features a similar interface, judging by preliminary shots shown off in the project video. Like OUYA it will also be open, and the company is already in the process of working with developers to bring titles to the console, which it may have an advantage doing, given that it has worked with developers to port titles to Smart TVs for the past three years. And the GameStick’s design is the part that really sets it apart from the OUYA – it’s a tiny stick the size of a flash drive with an HDMI connector, that ships with a Bluetooth controller that it actually fits inside of when you want to pack it for travel. The GameStick packs an Amlogic 8726-MX processor (which is a dual-core Cortex A9 chip at 1.5GHz, along with a dual-core Mali 400 GPU at 400MHz), has 1GB of memory and 8GB of flash storage, uses Bluetooth 4.0 and 802.11b/g/n for connectivity and runs Android Jelly Bean. It can connect to gamepads, mice and keyboards, and supports up to four controllers connected at once. The processor choice, while underpowered compared to the OUYA’s quad-core Tegra 3, which was designed by Nvidia specifically to work well with games, is said to have been chosen because of the unique power and heat requirements of the GameStick’s extremely portable form factor. GameStick team lead Jasper Smith said in reply to a Kickstarter commenter that it should be more than enough to handle today’s top Android games. 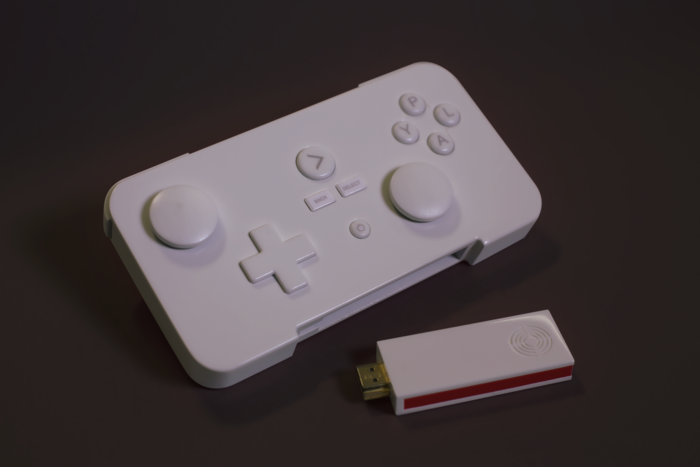 GameStick hopes to ship its device by April 2013, with prototypes going out to early backers by March. If you’re keeping track, that would put it just one month behind OUYA in terms of making it to market, should both projects stick to their anticipated timelines. The GameStick is also priced at $79, meaning it also hopes to undercut the competition on price. Of course, as with any Kickstarter project, there’s no guarantee we’ll see either of these make it to market, but obviously companies are seeing a demand here for low-cost alternatives to the big legacy players in home gaming. I doubt the smaller upstarts will remain alone in this market for long.